A Sesame Street partnership is a big coup for any company – let alone one that’s only existed for four years and produced two Indiegogo-backed products. 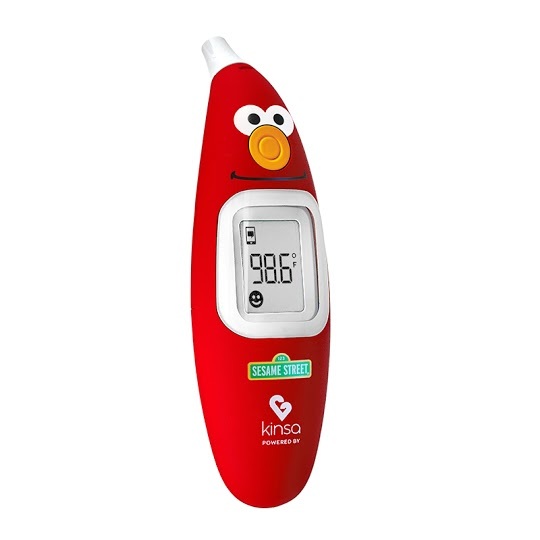 But Kinsa’s line of smart thermometers clearly struck a chord with the team behind everyone’s favorite educational monsters. The hardware startup’s third official product is also the first connected device to get the Sesame stamp of approval. The Elmo Smart Ear Thermometer is an update of the company’s existing ear thermometer that heavily incorporates the beloved red Muppet into both the product design and app. The thermometer is a sort of oblong, limbless take on Elmo, colored bright red, with an orange button standing in for his nose. The app — which is peppered with Elmo’s voice, spouting encouraging phrases like “good job” — will be available both for the new devices and users with existing Kinsa ear thermometers. The Elmo Smart Ear Thermometer launches today through Kinsa’s site, priced at $60. It will also be arriving in Target’s new “Connected Baby” section starting next month.